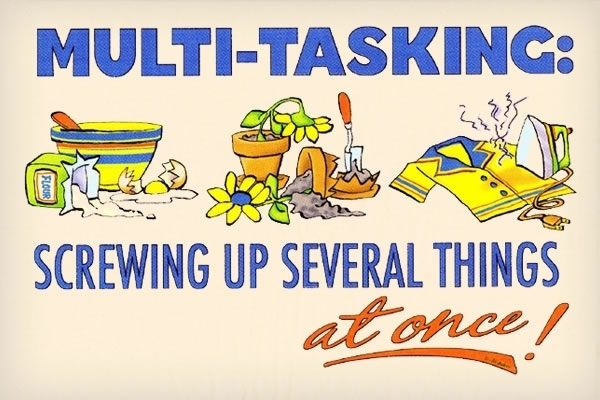 These findings, published in the journal Nature last week, underscore why people aren’t very good at multitasking—our brains are wired for “selective attention” and can focus on only one thing at a time. There may be a lot of motion, but new evidence suggests multitaskers are not getting much done. Scientists are now saying our brains have developed to focus on one thing. Our brains filter sight and sound to highlight whatever it is that commands our attention. In fact, the more attention something requires, the less attention we can pay to other things. This news not only impacts our work, but also our highways. Think about those people talking on cellphones. Sure they may be looking at the road, but their command center, their brain, is focused elsewhere. I read one story that reported the average 20-year-old talking on a cell phone had the reaction time of an 80-year-old. How many times have you waited stopped at a greenlight as the driver in the car in front of you chatted away? Hopefully we can drive a stake through the multitasking myth and recognize its use as a meaningless cliché. A term and a practice that indicates a person is really not paying attention. Posted on April 26, 2012, in Business, Life, Management and tagged brain, cell phone, driving, focus, multitask, people, phone, science, work. Bookmark the permalink. Leave a comment.